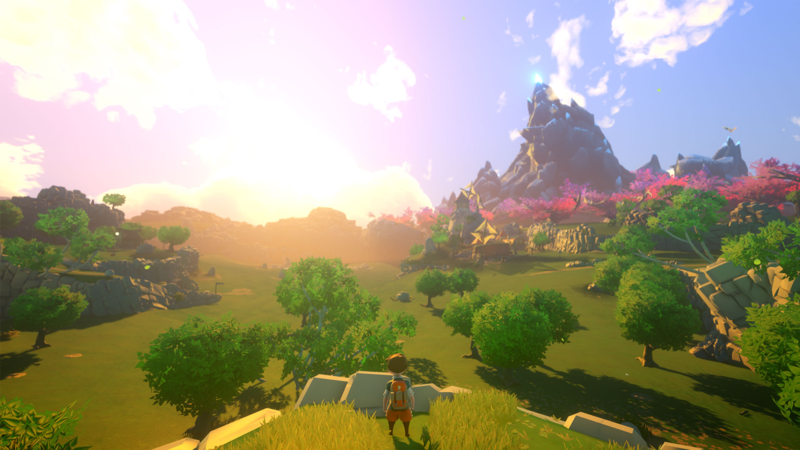 Yonder – The Cloud Catcher Chronicles – Review – AiPT! As a Dad of two boys, a great deal of our playing involves fighting. From slaying evil dragons with swords in the backyard, to blasting various comic book baddies with repulsor rays as Iron Men, violence seems to be a key component of what young boys think of as fun. The vast majority of the video games I play tend to reinforce this. Link swinging his sword through Octaroks and Mario stomping on Goombas all have violence as the key element in the game play. Sure there are puzzles to solve throughout, but without that slash and stomp, our protagonists would find themselves pretty outgunned. Yonder, the Cloud Catcher Chronicles – a game from Prideful Sloth – bucks this trend by creating a game world more like our own. Filled with humans who want to help, and animals who are friendly via domestication or through food bribery, It’s a very refreshing game to play with young kids. Your character, a young boy or girl, finds themselves shipwrecked on an idyllic island named Gemea. You have a backpack, the tattered clothes you own, and a celestial compass – something that will help lead you through the story quests, villages, and farms. You’re tasked to find sprites, and to survive the very minor dangers that await you. There’s no health bar, no way of dying, and no timer. Picture a cross between Stardew Valley, Zelda, and Harvest Moon. You adventure around the island and use various tools to find items, plant seeds, domesticate animals, and clear Murk – a bad purple cloud that you can disperse via the aforementioned sprite creatures. There’s no urgency to any of these various quests, and you can spend your time just poking around and cleaning up piles of animal poop at your farm – a task my boys find hilarious. Essentially, it’s this no pressure environment that I find to be the best part of the game. You can just explore and enjoy finding things and uncovering mysteries. It’s no Breath of the Wild, but it’s trying to track some of that delight. Graphics wise, it’s adorable. Your character is a very basic boy or girl avatar, with some level of customization, whom you can then dress in a variety of strange pirate gear. My sons preferred our boy character wear an eyepatch and a Viking helmet at all times. The environment is lovingly crafted, with flowers, trees, and grasslands galore, but the real stars are the animals. As you explore, you discover quite a few creatures, all incredibly cute and cuddly. If you have the right materials, you can feed the various beasties, and then have them follow you back to your farm to produce items like milk, clay, etc. Outside of fishing, I’ve not harmed a single creature since setting foot on the island, another unique experience in an open world game that typically asks you to provide fur, teeth, and bones to complete quests. As someone who’s been playing video games for 35+ years, the game lost a great deal of its shine quickly. I had fun, poked around, adventured a bit, and felt like I have seen quite a bit. I’m old, and jaded, and frankly – I like killing Octaroks. My kids’ experience was very different, as it seems designed for that age before the quick reaction most video games requires sets in. My 5-year-old chalked up achievement after achievement, adopting animals and tending his farm. The only point where the same frustration started to set in was the fishing mini-game, which might be the most difficult piece of the overall playtime. He sat and played for two hours today, and was especially thrilled to find the Halloween town, as he then popped on a costume and went trick or treating, thrilled this was possible at all. Yonder is something else. In today’s world where all heroes define them by the enemies they vanquish, the game takes a different track. Relax, adopt a big mammal, and tend your farm, and maybe save the world. No pressure. No weapons, no enemies, and no pressure, Yonder is a relaxing game that fits perfectly into a young child's play space. Sit and watch and enjoy. My kids didn't feel the frustration that games with twitch killing controls require and were able to relax and just explore. The game's plot is very surface level, as no antagonist equals no driving conflict. While the game shines at night, the sun glare during the day would make JJ Abrams proud.